Title says it all except I'ma elaborate here... I am thinking of the way to get the cleanest cable routing and actually wondering if internal routing really is the way to go. Now, hear me out... My internal dropper cable must go awkwardly out the slot, past the left crank and it does a helix on the DT routing with the brake line (I could have them on different sides of the head tube to avoid the helix but thats not how it's set up right now and I would have to trim the hydraulic line even more to make that happen and I feel like it will affect the steering with less cable). Anywho, I saw another singlespeed with a non-stealth dropper and it just looked way cleaner. One droppah cable on the bottom of the TT and the back brake going down the DT. It made me wonder if my stealth routing was all that cool. Do non-stealth posts work any less amazeballs? Most external droppers route to the seat clamp not the outer tube so the hose/cable has to move up and down with the post. This makes routing more complicated and causes extra rubbing so I would advise to stay with stealth style routing if your frame is compatible. Kris @ 44 wrote a great blog post about this a year or two ago. I'm not a huge fan of internal routing for a seatpost. Makes initial adjustements more complicated for no real added value. if (when) it needs serviced you can take it off easily and you can also trade it for the rigid one you keep under the truck seat for the same reason. -1 for external routing to the seat clamp. The housing moving around as you raise/lower gets on my nerves. No doubt external routing makes setup + maintenance more convenient though! On my MTB not setup for stealth, have had good success with the Fox Transfer dropper. Its external routing goes to the base of the stanchion, not the seatclamp, so has a fixed mount location. Have your cake + eat it too! How "internal" are we talking? I am fine with a clean slot in the side of the seat tube and a stealth dropper. Routing the cable into the front of the frame someplace and under/ over the bottom brackets seems silly. I have an external dropper with the cable at the collar because I don't have a hole in my seat tube for a stealth option and I didn't want the cable attached at the saddle clamp for the reasons stated above. It seems that there are more and better options for stealth droppers and they are not going away. Go stealth for some of the same reasons you would not go non-boost at this point. What bike are we talking here first for reference's sake? Here's the blog post in question. My bike? One of the latter Cielo 29ers to roll out of Chris King before they quit frames. It came (unbeknownst to me at time of order) with the stealth routing easter egg, a little slot on the non-drive side by the BB, designed to curve up and go on the underside of the DT. I've had almost two trouble years with it, just thinking about what's cleanest in the event I source a new dropper, since as my routing and cable length go, they need to do that little helix. Edit: I could solve with re routing and re-trimming stuff, but like I said, I don't want to mess with steering as both cable and hydraulic hose lengths are fine at the bars right now, and I happened to see another SS rider with an external that looked super clean. Edit: I could solve with re-routing and re-trimming stuff, but as I said, I don't want to mess with steering as both cable and hydraulic hose lengths are fine at the bars right now, and I happened to see another SS rider with an external that looked super clean. That's how most internal ST cable routes are solved: inside the ST, exit non-drive side them up the side of the DT. The only issue is with this (IMO) is the cable is on the same side as the lever. The cleanest way is when the route wraps around the HT and either enters the DT or is routed down the drive side. But that aesthetically puts the dropper line on the drive side. The cleanest solution I've found is Fox's Transfer. And I've seen the post run technically backward so the actuation on the bottom half of the post is on the non-drive side. Does the frame have under the top tube cable routing? You're kind of stuck with what the frame's cable management offers. 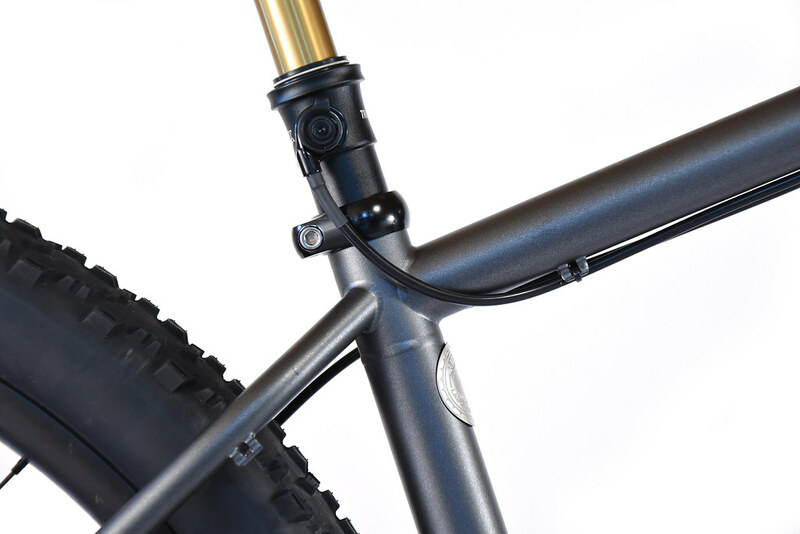 With cable actuated parts, you want the smoothest transitions and no hard kinks in the line (or multiple bends in-line). This is a classic example of how not to route cables at the time of production... The harder the bend, or the more bends in-line, the more likely that cable will saw into the housing and create drag. Last edited by fortyfour; 11-26-2018 at 02:41 PM. I've swapped droppers back and forth on a couple of frames. Not a mechanically difficult task provided the routing is good. The only downside to internal would be that to completely remove and re-install a cable you're going to be using a fresh cable. So unless you're planning on swapping posts there's not much argument for external atmo. I have a full season on my own Fox Factory Transfer. So far so good. It has a nice audible "pop" when it returns to full extension. I've noted that both my 9point8 and Fox have ever so slight play at the head of the post but that's in the parking lot. I haven't noticed that same play out on the trail. Thomson? Nada. No matter what post though, always mate it with one of Wolftooth's Remote Light Action levers. Such a nice upgrade. We should merge this with Lionel's anti-dropper thread, just so visitors to the Salon know there's no question that the question isn't whether to drop, but which one and how much, amiright? I feel like the pro-drop voice should be the last word. Fox is the most reliable post I've used. Wish they made one that had 200mm of drop.